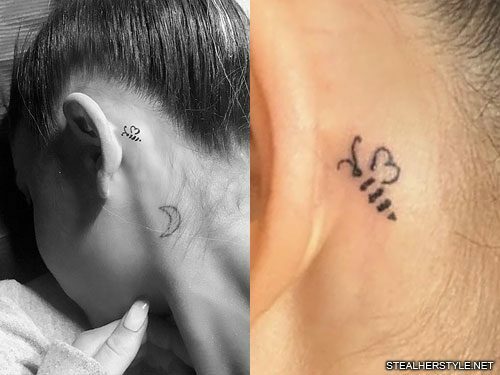 Ariana Grande has a tattoo of a bee behind her left ear as a tribute to the victims of the terrorist attack at her concert in Manchester. The worker bee is a historical symbol of the city of Manchester. Grande has made many tributes to help the victims and their families, including her ‘One Love Manchester’ tribute concert, which has helped raise 2.6 million dollars for survivors and their families. Grande has also offered to pay for funerals, hospital bills, and dropped a new single in honor of the victims. Grande’s whole crew have bee tattoos as well. We Love Manchester Emergency Fund has now raised a total of 12 million, thanks to Ariana Grande. Ariana posted a letter on Instagram, including the line “Our response to this violence must be to come closer together, to help each other, to love more, sing louder, and to live more kindly generously than we did before.” Ariana is truly doing that. 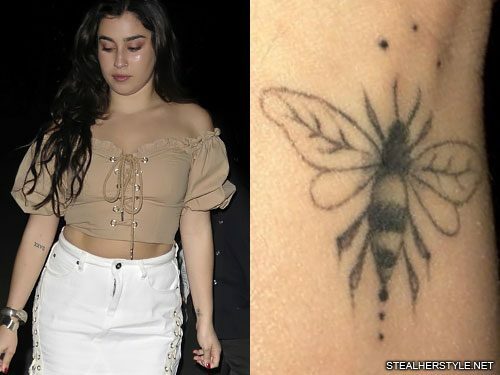 Lauren Jauregui got this tattoo of a bee on the inside of her left wrist in February 2018 but hasn’t yet opened up about it’s meaning. It may have something to do with Halsey and their collaboration song “Strangers.” Halsey created a fictional world based on Romeo and Juliet as the theme for her album Hopeless Fountain Kingdom. One of the two dueling families is the House of Aureum, whose family crest is a bee. Madison Beer has a teeny-tiny bee tattoo on the inside of her right ankle. 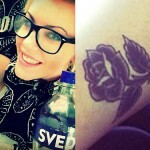 It’s somewhat of matching tattoo, but not exactly. 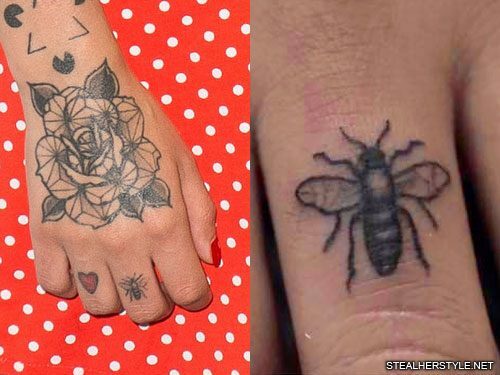 Her boyfriend Zack Bia has a much larger and more intricate bee tattoo on the back of his arm which he got from artist bodiesneedrest in November 2017. 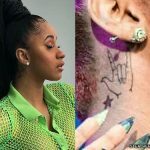 His tattoo also includes a letter “B,” presumably for his last name Bia. Madison got her pared-down version of the bee from the same artist a month later. They went together to The Honorable Society Tattoo Parlour in Los Angeles on December 6, 2017 and Zack sat by her side while Madison got her own tiny bee to match his existing ink. 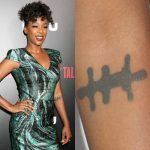 In a May 2018 tweet, she confirmed that these are her only two tattoos, but she may get more in the future. I have two! a lip tattoo that says Honey I got about 2 years ago and a little bee on my ankle I got like 6 months ago. 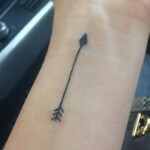 I might get more but very small ones. 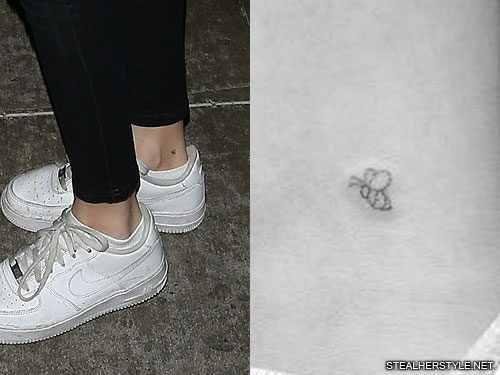 Sasha Lane has a honey bee tattoo on her right foot. 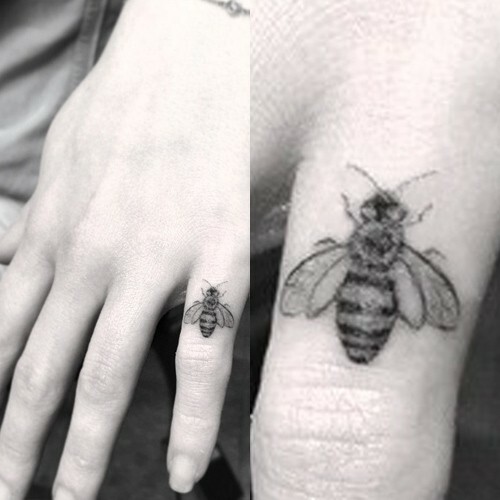 Julia Michaels has a bee tattoo on her middle knuckle on her right hand. Jessie James Decker has a honey bee tattoo on her right wrist. Emilia Clarke has a bee tattooed on her little finger on the right hand. The ink piece was done by Dr Woo.